First, the good news to start the week off with. 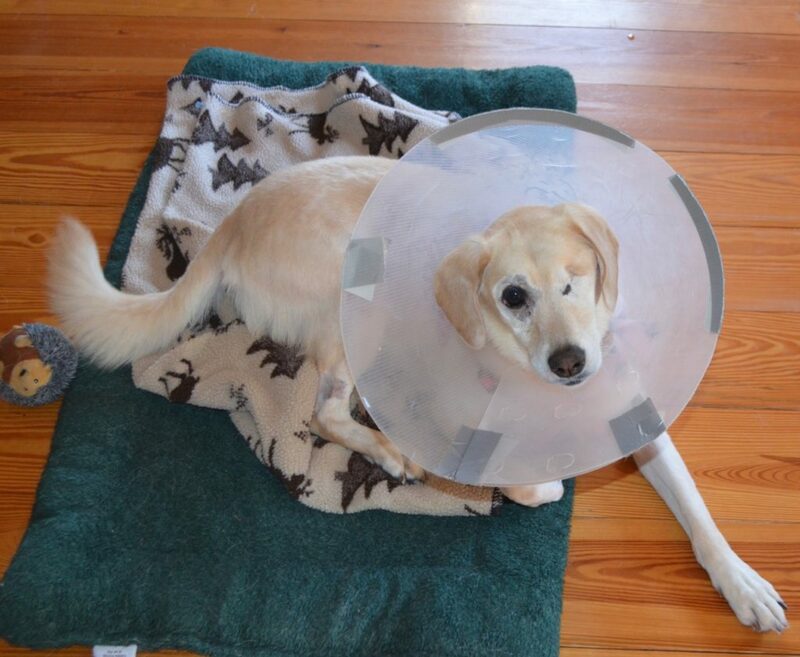 Blind Millie had her eye surgery last Tuesday, which was a pretty complicated deal. Our veterinary ophthalmologist at Peak in Burlington, Dr. Sarah Hoy, opened up Millie’s cornea, removed?her?luxated (displaced) lens, then performed?endolaser surgery to destroy part of the cilliary body in the eye that produces the internal fluid (to avoid glaucoma, which can be a potential side-effect of this kind of lens replacement). Then she sutured into place a new synthetic lens, and finally closed up the cornea. (The suture material Dr. Hoy uses is thinner than a human hair and barely visible to the naked eye!)? When I got Millie to the clinic early Tuesday morning, her eye pressure had suddenly spiked to 31, which is in glaucoma territory. Her pressure had been normal before, though at the high end of normal. 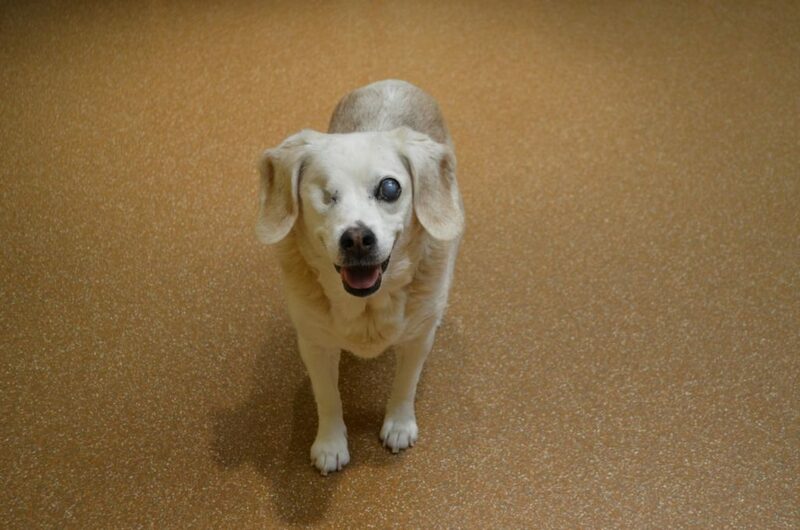 We don’t know what caused the spike, but it meant one thing: If we didn’t do the surgery, Millie would definitely develop glaucoma, and we’d never get a chance to restore her vision. So we proceeded with the surgery, and Millie came through it just fine. She spent the week at the clinic because this procedure requires careful, round-the-clock monitoring for pressure spikes. As it turned out, Millie’s eye pressure dropped too low at some points during the week, meaning the ophtho team had to keep adjusting the glaucoma meds she was getting. Intraocular pressure that is too low is also a problem, because that pressure (created by the fluid in the eye) is what keeps the eyeball inflated and is what holds the retina in place against the back of the eye. So it’s a balance — that normal range — that is so crucial. But by the end of the week her pressures were normal, and I was able to bring her home on Friday afternoon. Since we have a Tono-Pen here, I was able to test her eye pressure over the weekend, and thus?far?it?has remained in the normal range. Millie is having difficulty navigating around, and Dr. Hoy explained to me that there is still inflammation and some blood in the eye from the surgery, and it will take a couple of weeks for all that to clear up and before we will know how successful the surgery was. This isn’t like regular cataract surgery, where the cloudy material is sucked out of the lens and the eye is immediately clear and visual again. This is a much more gradual process. For the moment, though, we are cautiously optimistic. I will be taking her back later this week for a recheck. We continue to give her multiple eye medications throughout the day. So far … so good! In less than good news, we found out my beloved Darla now has kidney disease. You may recall that she’s had four mast cell cancer surgeries, her spleen removed, and knee surgery, all this following her initial cataract surgery when she first arrived. But in the past several months we’ve also been managing a rare chronic liver problem called copper storage disease, which requires several medications and a special diet. Last Tuesday we finally got her liver enzymes, ALT, down to a comfortable range … only to find her kidney values had shot up on the same blood work! She now has only 25% of her kidney function left. On Friday, when I went to pick up Millie, I took Darla back in for an ultrasound of her abdominal organs, which looked good, thank heavens. We also did a urine test and are waiting for the results of that. But this is an entirely new problem we are going to have to treat. And in the worst news … we lost little Aurora last night. She’s’the fourth dog we’ve lost in five weeks, so we are kind of reeling from all this. Aurora?passed away while sleeping. When I?walked into the dog room this morning, I first thought she was asleep — she was lying on her side in her crate, very peaceful looking, her blanket as smooth as it was when we put her to bed yesterday evening. There had been no struggle, no paddling with her feet, no slumping over. It was clear her heart had just stopped while she was asleep. You may remember Aurora had a very rare kidney disease called protein-losing nephropathy, which is a difficult?and tricky thing to manage. Usually it results in death pretty quickly. But thanks to our internal medicine specialist at Peak, Dr. Marielle Goossens, who didn’t give up and found the right combination of medications and dosages, we were able to keep Aurora healthy and stable for over two?years. With multiple injections of heparin (to prevent blood clotting) and other oral medications every day, Aurora did remarkably well all this time. For nearly?a year I drove her to Burlington for weekly tests to check her blood work and clotting function, which required specialized tests at Cornell, and Dr. Goossens used those results to adjust and taper the medications. Eventually we were able to get to monthly trips, then every couple of months. Her last round of tests was just a month ago, and everything looked good. We don’t know how old Aurora?was — she was already a senior when she came to us in early 2013. With her protein-losing nephropathy, she defied the odds for a long time. We?were just grateful we had her as long as we did. Praying Millie’s surgery will be completely successful, and so sorry for the loss of Aurora. Your hearts have really taken a hit recently. Praying for God’s comfort over both of you also. You are such special people and dearly loved by many, including us! oh my!!! My heart is heavy with the news of Aurora and I am praying and hopeful that Darla is able to manage her new issue. I am ALWAYS so amazed at the care and love you show these animals. You stop at nothing to give them the best life possible. We are so happy to support you in your efforts to make such a positive difference in the lives of each animal in your care. I’m so very sorry for the loss of Aurora. You all have really been thru a sad time lately. This is one of the things I admire about y’all so much. You take these babies in not knowing how long they will be with you but give them so much love & quality of life without thinking of the sadness you will go thru losing them. You are both very selfless. I’m sorry to hear about Darla. I know everything in your power will be fine to keep her comfortable. Thinking good thoughts for Millie that she will adjust soon & improve rapidly. So sorry to hear about Aurora. She had a wonderful life at the Farm and I’m sure she was thankful for every day. Here’s hoping that Darla’s new issue can be helped with medication and that Millie has a good recovery. I can’t imagine how you are both dealing with all the losses as I know they make your heart so heavy. But we all know that these all the dogs had the best lives possible and lived happy lives with their doggie friends. Aurora had the best of the best her last years. How wonderful that she went in peace. It’s all we humans wish for……right? I’m so sorry to hear you humans are having to deal with so much loss in so short a time. I hope you are comforted by the knowledge of all the joy you have brought these passing little beings. UGH! I’m crying. Thank you for loving Aurora like she deserved and giving her a lot longer quality of life than she would have had if she’d hadn’t lived with you. I’ll miss that sassy, spunky girl. Hugs, S & A.
Oh, I’m so sorry about Aurora. It was the best possible way to go for her, safe and happy and just going to sleep, but a shock for you. I know you’re missing her. I hope that Darla manages to hang on for a while longer. This is a lot for you to deal with all at once. Best wishes to Millie for a speedy recovery! It’s been such a rough few weeks. I’m so sorry for you all, so grateful that the dogs have the life with you that they do. Aurora will be missed. I hope things can be steady for Darla for a while, and that Millie’s recovery continues. Thoughts with you both. This has been such a terribly sad several weeks for you. All of us who follow your blog and the exploits of the dogs also feel your sadness. It would be hard enough to lose one animal but to lose this many is heart breaking. Please know you are in our thoughts. And know that you gave each one of these dogs a good life from what they had. They knew they were loved. Too much sadness going on for you two. Give the rest of the dogs lots of extra loving”. I am so sorry to hear that Aurora passed, but to die in her sleep is a beautiful way to end the beautiful life you gave her. and for that, I am so sorry. Be patient and take good care of yourselves. All of this is a lot to take in, in a short period of time. Oh Aurora, sweet girl, rest in gentle peace. You were so loved, and I’m so glad you had a “happily ever after” in your life. I remember when it was Beagles vs Doxies at RDF – I think they are all gone now, aren’t they. 🙁 Such sad times, I am so sorry for you and Alayne, I am sure your hearts are breaking. I am thinking good thoughts for Darla. And cautiously optimistic for Millie. Life at RDF must go on, I know, even with heavy hearts. Heart-warming and heart -‘bending’. Feeling for all sentient beings at Rolling Dog Farm.